Live Caribbean Stud Poker is a unique action-packed and a fast-paced variant of side poker that features the perks of each player being able to place unique side bets. In many ways, Caribbean Stud strategy is very similar to five-stud poker where the players play against the house instead of competing against each other. There is, therefore, no bluffing involved thus making the game playable even if there is only one play. Caribbean Stud Poker strategies are also quite easy to come up with especially since Caribbean Stud is played on a one to many basis where only a single hand is dealt – an unlimited number of players can then place bets on this hand. Nevertheless, simpler games can also become complex when you’re playing with skilled players. As the name suggests, Live Caribbean Stud poker is based on the rules of other stud poker games. As such, if you are familiar with the gameplay of stud poker, then transitioning to Caribbean Stud will definitely be more of a breeze. The most significant difference here, of course, is the fact that players are competing against the casino’s dealer instead of being pitted against each other. All of the players’ hands are dealt face down to eliminate underhand Caribbean Stud strategies like card counting that give players an advantage, and only one of the dealer’s cards is revealed. Caribbean Stud poker includes the Ante-raise-fold betting structure where both the dealer and the player are dealt five-card hands each with the player being given the option to make an additional jackpot bet in the quest of building up a huge hand which guarantees a win. Live Caribbean Stud Poker uses a 52-card deck without the jokers. 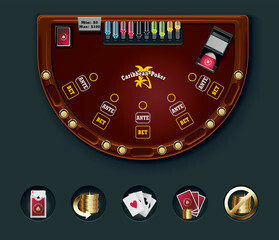 Players have only 16 seconds to place their bets which is done by choosing chips offered on the screen. The selected chips are placed on the Ante bet by the play before they are dealt five face-up cards. The dealer is also dealt 5 cards but only one of these cards faces up to avoid player advantages such as card counting. After this point of the game, players are required to make their decisions. To double your Ante bet you can either to choose to fold or call. The dealer then reveals the house’s hands right after the player has made a decision. To qualify, the dealer’s hand must consist of both an Ace and King or better. In case the dealer’s hand has neither cards or better, it does not qualify and the Ante bet pays 1:1 while the Call bet is returned. In case the dealer’s hand qualifies, a winning hand is determined according to standard poker hand rankings. On the same note, if the dealer’s hand is better than the Ace and King, the player loses both the Ante and Call bet. On the other hand, if a player’s hand is better than the dealer’s, the player wins an even amount of money on the Ante bet and a payout on the Call bet according to the poker hand rankings and paytable. As far as side bets are concerned, as soon as the player places the Ante bet, the 5+1 Bonus side bet is availed to them. Making this wage means that the player bets that all his cards plus the dealer’s face-up card will form the best possible poker hand. Royal Flush with this bet pays 1,000:1. This side bet pays if the player’s had is Three of a Kind or better. Developing a suitable Live Caribbean Poker strategy is key to getting the very best out of this exciting casino game. One such strategy involves sticking to the simple and straightforward principles which almost always guarantees a win. A very important step in Caribbean Stud Poker is that which involves being acquainted with your hand. Players need to be very knowledgeable about what it takes to make a winning hand with the best possible combination of cards. If you are familiar with how the cards you have rank, then it will be easier to make more informed decisions as the game proceeds. Also, it is very important to think everything through before you decide to fold. While it is often safer to fold a weak hand in order to avoid losing more money because of a weak hand, mastering the art of risk taking could just be a great way of turning the game around even if you initially had a weak hand. First, always raise if your hand consists of a par or better- and second, always fold if you have less than the dealer’s qualifying hand. As you can see, despite the numerous ways you may try to build a great strategy, the most optimal and probably the best strategy is based on the player’s ability to make correct decisions with regard to folding or raising their hands based on the relative strength of their five-card hands when compared to the house’s or the dealer’s hand.